Do you need a little Mojo this year? How about 70 pounds of Mojo? Well, we have just the guy for you. This is Mojo, a 4.5-year-old terrier mix who would love to be your new pal. Mojo is a happy boy who loves people. He loves kids, car rides, walks, playing . . . this guy is just full of love! Mojo would enjoy a home where he can be active and get exercise daily but still get some snuggle time as well. Mojo is good with most dogs, but pushy male dogs get on his nerves a bit. We would want to do a meet-and-greet before he goes to a home with other dogs. 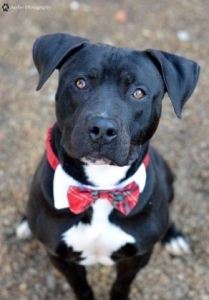 If you think Mojo is the guy for you, come adopt him today at the Humane Educational Society. Professor X is one cute little kitty! 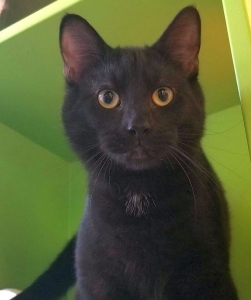 He’s a 9-month-old black cat with a tiny little patch of white fur on his chest and beautiful yellow eyes. When you go to the free-roaming cat room, he’ll stealthily sneak up beside you to say hello. Professor X is friendly and outgoing with both people and other cats. He enjoys being petted and has a sweet, soft purr whenever he’s happy. If you’re looking for a cute kitty with tons of sweet personality, Professor X is your man.